One prisoner’s ploy to get out of jail by claiming police brutality backfired when a video recording from the holding cell revealed his black eyes and bruises were deliberately self-inflicted. California resident Aleksander Robin Tomaszewski, 33, alleged he was roughed up by detectives during an interrogation in January, and filed a complaint alleging police brutality. He was being held in Eugene, Oregon on a number of charges, including stalking and first-degree sexual abuse, reported The Register-Guard, a local newspaper. 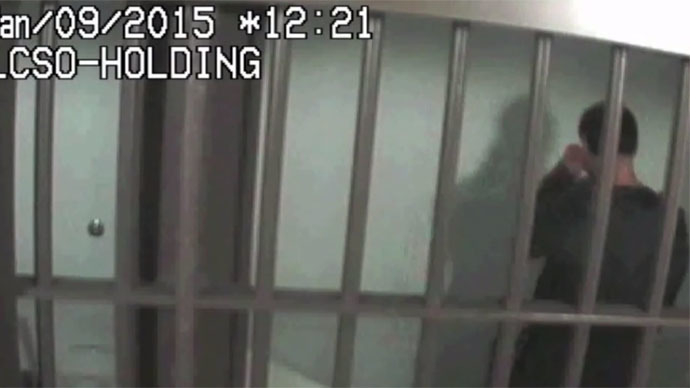 Unfortunately for Tomaszewski, surveillance camera footage of his holding cell clearly shows him punching himself in the face, 45 times to be exact. When told his self-inflicted beating was captured on camera, he allegedly confessed to staging the incident in hopes of securing his release, according to the Lane County Sheriff’s department. Instead, the false report is costing him $100 and 20 additional days of jail time. On February 11, Tomaszewski was sentenced to 20 days in jail, 36 months probation and a $500 fine for attempted coercion.